She choked up reading the poem. And I like that about the next secretary of the Air Force. That’s not the only thing I like about Heather Wilson, who will soon leave her job as president of the South Dakota School or Mines & Technology to join the Trump Administration as the civilian head of the U.S. Air Force. She fly fishes, too, you see. Poetry and fly-fishing? Those are essential attributes of a nominee facing the U.S. Senate confirmation process for any big-shot-government job. Some have been confirmed on a lot less, including at least one just recently. 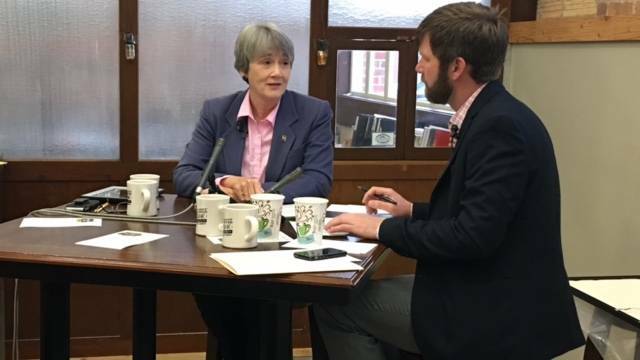 But this discussion is about qualified candidates, like Wilson, who spoke Wednesday morning about her four years leading South Dakota Mines and the coming confirmation process and Air Force work to follow. Mines students began arriving well before the 7 a.m. start of the event at The Garage, which really was once a garage, for mostly foreign sports and specialty cars. That was before the Numad Group turned the building into a “contemporary co-working space” in downtown Rapid City that presents monthly speakers for its Morning Fill Up. They got coffee and compelling conversation. At Ehlman’s request, Wilson looked back to her point of contact with the Trump administration on the Air Force Secretary appointment, which came officially from a Marine — retired Gen. James Mattis, Trump’s exceptionally well-qualified Secretary of Defense. “When General Mattis called to talk about it, I said ‘Sir, you do realize that being a university president is the best job in America, right?” Wilson said. But being a fearless commander noted for showing up on the front lines to be with his Marines, Mattis won Wilson over. And he didn’t have to worry about the qualifications of this particular nominee. A U.S. Air Force Academy graduate herself, Wilson earned master’s and doctoral degrees as a Rhodes Scholar at Oxford. She served as an Air Force officer in Europe and joined the National Security Council at the White House in the Bush 41 administration. She served a decade in Congress from New Mexico and chaired the House Subcommittee on Technical and Tactical Intelligence, and also served as a cabinet secretary for the state Department of Children, Youth and Families in New Mexico. In the private sector she did consulting work for national laboratories. And in one instance, that led to a critical review by the U.S. Energy Department inspector general of the reporting practices by a contractor for Lockheed Martin’s subsidiary Sandia National Laboratories on some contracts with Wilson. Wilson has said her contracts were appropriate and fulfilled her service agreement. She also has pointed out that she was not part of the Sandia Contract Strategy Team that the inspector general’s report criticized. Democrats also raised questions over allegations that Wilson was instrumental in the firing of a Democratic U.S. Attorney in New Mexico, never-proven claims that she rejected. As a member of Congress, she made the Dirty Dozen list — which typically tilts heavily against Republicans — compiled by the League of Conservation voters, for votes league officials contended sided with industry and against the environment. She was praised for being a leader in passing upgrades to foreign intelligence surveillance law that supporters said were critical to homeland security and some critics feared went too far. Some of those issues are likely to be raised by Democrats during the Senate confirmation process, one that seems almost certain to end in her confirmation. Presuming that, she and her husband, lawyer and retired Air Force Col. Jay Hone, will be facing a dramatic change in living environment. That part won’t be easy for Wilson, because she loves Rapid City and the Black Hills. She shakes her head at those who make unflattering comparisons between Rapid City, a city of 70,000 with a relatively stagnant population growth rate and ongoing challenges in its economy, with Sioux Falls and its more robust economy and 180,000-and-growing-fast population that is projected to hit 215,000 within 10 years. Wilson said that because of its widely respected standing as a top-flight science school, South Dakota Mines will help lead America into the future. And that will make Rapid City essential, too. She said most problems in the 21st Century will have technological solutions, which inquiring minds at Mines will help to address. Rapid City will continue to benefit from that. “We are all better off because we live in an educated community,” she said. Wilson said it’s important to continue to fight illiteracy and provide help to “adults who can’t read” but she also wants more focus on “adults who can’t do math.” That means assuring that students can do math, and do it well. Along with addressing the financial problems she inherited four years ago, Wilson said helping promote the “deepening engagement between the university and the community” is among her most significant accomplishments. The most urgent needs at Mines are improved and expanded facilities for research and development, upgrades in the minerals and mining building and someday a music center, she said. Although science driven, 10 to 15 percent of Mines students are in music programs, she said. That point led to a bit of an arts discussion. And when asked about her favorite poems, Wilson returned to her New Hampshire roots and to Robert Frost. Although born in San Francisco, Frost moved to Massachusetts with his family as a child, grew up there and taught high-school English in New Hampshire before his writing career began. Wilson first mentioned Frost’s famous The Road Not Taken, an often-referenced poem where “two roads diverge in a yellow wood,” and present one of life’s many crossroads decisions. Wilson is certainly at her own point of divergence now, so the poem is particularly appropriate. But it was a portion of Ulysses by Alfred Lord Tennyson that she chose to read, with a voice that cracked with emotion as her eyes welled with tears. Fitting, certainly, for the inquiring mind and inspired spirit of the president of a university, and perhaps for an Air Force secretary. Either way, Wilson struggled through the reading, ending with a smile and a facetious comment: “Poetry is not very moving for me." But there was nothing ruinous about the reading, which held the audience in unmilitary attention and had one young woman near the front wiping away tears. Wilson might do the same if, as she expects, the move forces here to sell her Cessna 152 two-seat, single-engine airplane. That will come hard for a woman with a family history in the air. Her grandfather was a World War I and World War II pilot and also a barnstormer and wing commander for the New Hampshire Civil Air Patrol. Her father was a commercial pilot who began flying when he was 13. Personal aircraft are unusually personal in the Wilson family. Her father once used an interior room of their small home to begin building an open-cockpit airplane. So while there are thousands of airplanes in the Air Force, the one with the most emotional connection — the Cessna — might have to fly away without Wilson. She might have to cast away recently discovered rapture tied to her fly-fishing. Learning the artistic approach to fishing was a bucket-list delight that she accomplished after her move to Rapid City. Rapid Creek right in town holds a healthy population of wild brown trout. But Wilson avoids the municipal fishing options in favor of more isolated fly-casting, even if the catching isn’t as good. Favorites places are Little Spearfish Creek above Savoy and a stretch of once-polluted Whitewood Creek below Deadwood that has been restored to a wild-brown-trout stream. "Isn't that amazing?" she said. Here amazement fades when I bring up the Potomac River around D.C. , which sn’t a blue-ribbon trout stream by any means. But it does offer bass and catfish, shad and an occasional walleye or striped bass. I pitch that to Wilson to give her hope. But she isn't interested in such angling, and figures to be far too short on free time for much exploration of New England's great fly-fishing streams. “God gives you a gift and then comes back to check to see how you’re using it,” Wilson said. As she prepares to use that gift in the Trump administration, she finds wisdom and guidance through passages from Once an Eagle, a 1968 war novel by former Marine Anton Myrer that Wilson brought up when asked about mentors and sage advice. Once an Eagle has been read and praised and absorbed into leadership principles by countless military officers. Some have called it a “literary moral compass” for those in command. It is the story of career Army officer Sam Damon, an honorable man whose hunger for knowledge, intuitive leadership skills and sense of honor shape his career and the way he interacts with people and forces that are not so hungry or intuitive or honorable. That’s a pretty good principle to take to Washington D.C. Add some Frost and Tennyson, as well as a hunger for knowledge and innovation, and an Air Force secretary might do OK. Even if a good poem makes her cry. Saying goodbye to South Dakota's own "Marlboro Man"